Olympic Games. Top picture shows a boxer who had pounded the image of his rival until it toppled from its pedestal. 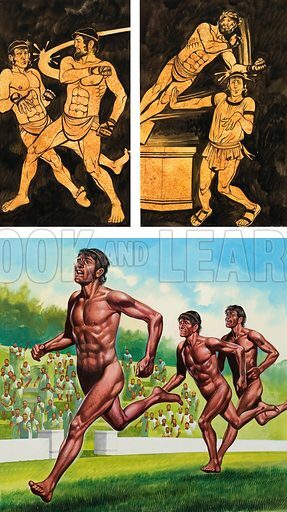 The lower picture shows the first victor, a man called Coroebus who won a foot race of about 200 yards in 776BC. Original artwork for illustration on p25 of Look and Learn issue no 544 (17 June 1972). Available worldwide for immediate download up to 2,997 x 5,339 pixels.